Boston College kicks off its 2018-19 season with a two-game road trip to Minnesota Duluth. - Boston College kicks off its 2018-19 season with a two-game road trip to Minnesota Duluth. The Eagles welcome back three gold-medal defensemen to their blueline, as Cayla Barnes (Eastvale, Calif.), Kali Flanagan (Burlington, Mass. ), and Megan Keller (Farmington Hills, Mich.) took the 2017-18 off to train for and compete in the Olympics in PyeongChang. - Boston College also claims the top four highest point-getters in WHEA among active skaters, including seniors Makenna Newkirk (Scottsdale, Ariz./29-57-86), Keller (15-59- 74), junior Caitrin Lonergan (Roslindale, Mass./31-41-72), and sophomore Daryl Watts (Toronto, Ont./30-25-55). - The Eagles were picked by the 10 head coaches to claim their seventh straight Hockey East regular season title. - Lead by long-time head coach Peter Van Buskirk, Holy Cross begins its tenure in Hockey East and as a Division I program with a six-game road swing, including two at RIT. - The Crusaders will play their first home game on Oct. 20 against Brown, and welcome league-foe Boston College to the Hart Center on Oct. 26 for its first home conference game. The first-ever Hockey East game for Holy Cross is set for Oct. 12 at Providence. - Merrimack begins its fourth season in Hockey East with a two-game home stand against Union. The Warriors lost no seniors from 2017-18. 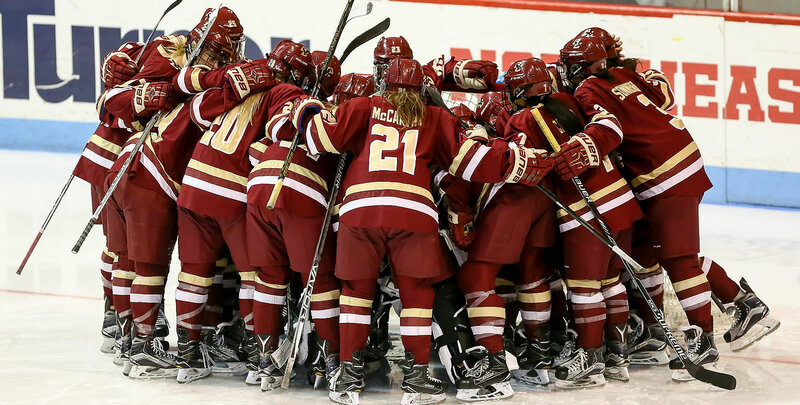 - Erin Hamlen’s squad adds five new-comers to 19 returning athletes, who finished just one game shy of the 2018 Women’s Hockey East Tournament. - The Huskies are coming off one of its most successful WHEA Tournament runs in program history, winning nine of its last 13 games to reach the WHEA championship game. - UConn has already seen the ice once this year, dropping an exhibition contest, 4-2, to the Shenzhen Vanke Rays on Sept. 22. - Coming of a season that saw the Black Bears win their first-ever WHEA playoff series and advance to the semifinals, Maine looks to improve upon its third-place regular-season finish in 2017-18 and program-record 19 wins. - Reigning Coach of the Year Richard Reichenbach adds five freshman to his talented roster, and returns top point-getter Tereza Vanisova (Strakonice, Czech Republic) and starting goaltender Carly Jackson (Amherst, N.S.). - Providence, helmed by first-year head coach Matt Kelly, boasts the fifth-highest active point-getter in Hockey East in senior Christina Putigna (Grimsby, Ont./19-31-50). Kelly seeks to improve upon the Friars’ 12-7-5 league record from a year ago, which was good for second place in the regular season standings. - The Friars have improved in their WHEA Tournament seeding in each of the last four years, but have not won a playoff series since 2013. - Brian Durocher’s outfit finished sixth in 2017-18 after finishing 8-11-5 in league play. - Redshirt junior Sammy Davis (Pembroke, Mass.) returns to the Terriers’ lineup after missing 2017-18 due to injury. Davis was named one of three captains of the Terriers for this year, alongside Reagan Rust (Southaven, Miss.) and Natasza Tarnowski (Embrun, Ont.). - New Hampshire finished fifth in the regular season standings last year (9-10-5), tied for its best finish since a fourth-place rank in 2012-13. - The 2017-18 Wildcats started 4-0-1 and posted its best overall record (14-15-7) since 2009-10. They have improved its winning percentage each season under head coach Hilary Witt. - The recently-rebranded Huskies boast a deep goaltending pool, with both 2018 WHEA Tournament MVP Aerin Frankel (Briarcliff Manor, N.Y.) and Brittany Bugalski (Boynton Beach, Fla.) returning in between the pipes. Frankel is the active leader in career goals against average (1.94) and save percentage (.933), while Bugalski’s 34 league wins are the most of any current conference netminder. - Northeastern enters 2018-19 after claiming the Bertagna Trophy as WHEA Tournament champions for the first time in program history in 2018. - Vermont begins 2018-19 with 15 members from last year’s team returning, including each of their top three point-getters, including Eve-Audrey Picard (Longueuil, Que./14-11-25), Alyssa Gorecki (Monee, Ill./8-10-18), and Saana Valkama (Pirkkala, Finland/6-8-14). - The Catamounts were featured on international rosters over the summer, as Kolowrat skated in three games for the Czech National Team at 2018 Euro Hockey Tour, while incoming rookite netminder Blanka Skodova (Šternberk, Czech Republic) earned a silver medal with the Czech Republic at the 2018 Women’s Inline Hockey World Championship.